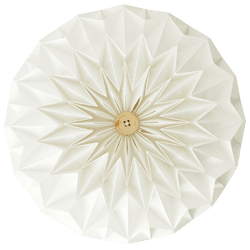 The lampshades are made of special FSC certified paper of the type Butterfly, which lasts for years and years. They can be easily cleaned by either using a feather-duster, blowing dust off or by using a vacuum cleaner at low power. The lamps come in a high quality carboard box. We have workshops every now and then. To see if there is workshop soon go to the page 'Snowpuppe on tour'.